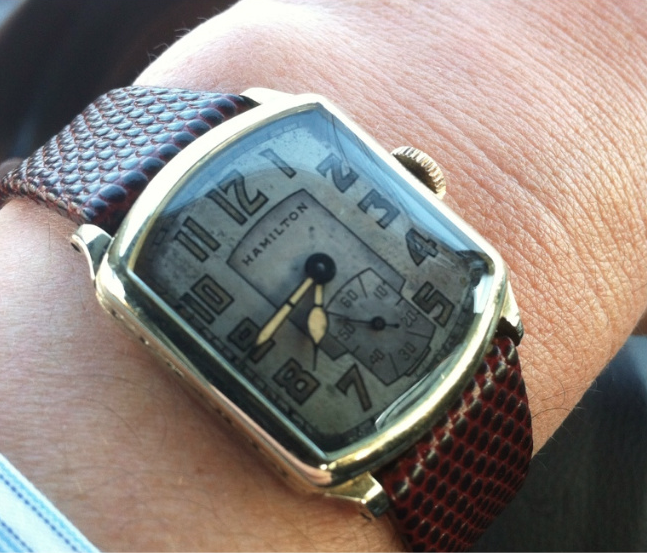 In the late 1920's many of Hamilton watches were called "geometrics" where the models were named based on their shape. One of the models was called the Tonneau. Introduced in 1927, the Tonneau looks like a barrel on it's side, where the top and bottom is curved and the sides are flat. The Tonneau was produced through 1932 and came in both solid gold and gold filled, and in green and white gold initially and yellow gold in later years.. In addition, case styles came with both engraved and un-engraved. The models are usually called Tonneau Engraved and Tonneau Plain, respectively. 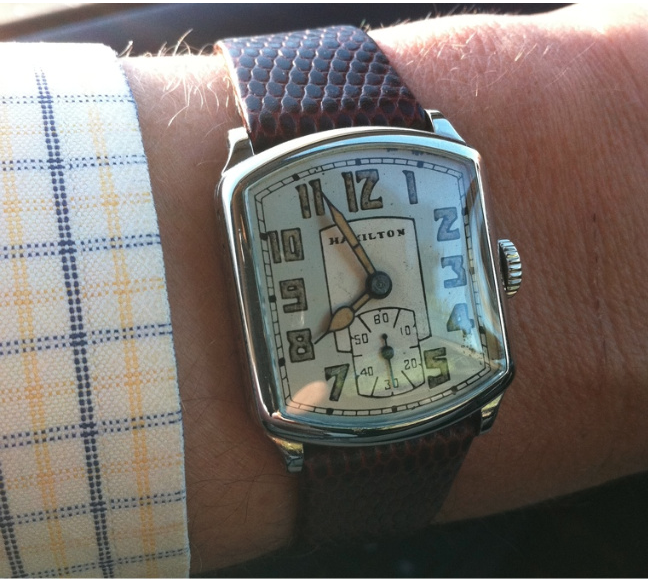 The Tonneau features Hamilton's 17 jewel, 6/0 sized 987 movement. It's a good sized watch and wears well on the wrist. Here's a wrist shot of a green gold filled Tonneau Plain model. and here's a white Tonneau Plain. 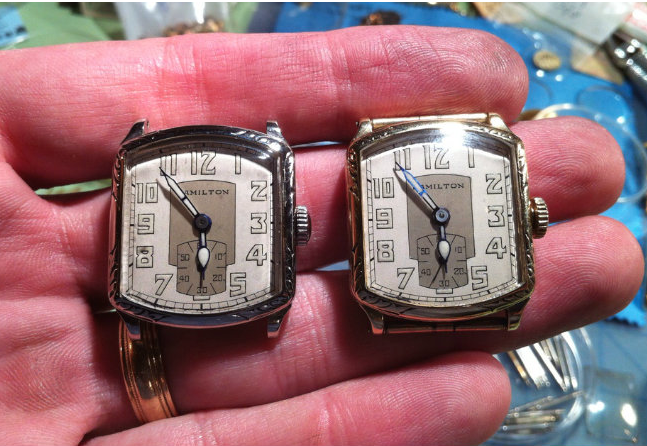 and here's a pair of freshly serviced and re-enameled Tonneau Engraved watches in white and yellow. 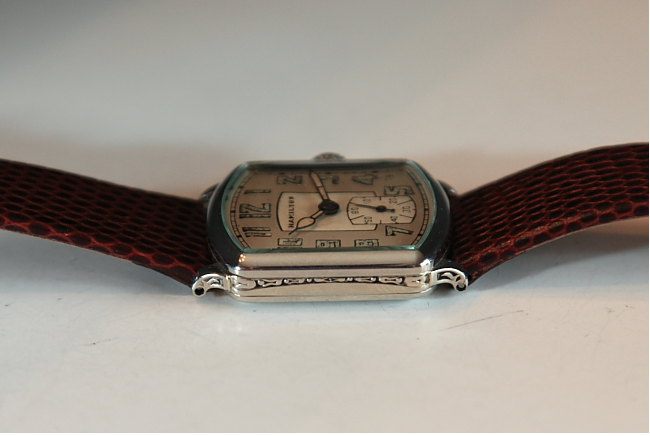 Even the Tonneau Plain model is engraved on the sides of the center case. The Tonneau is a sharp looking watch and even though all my examples have luminous dials, black enamel dialed and applied gold numeral varieties can also be obtained. I'm not the boss, you have me confused with my wife. Vintage watches are small when compared to modern watches. 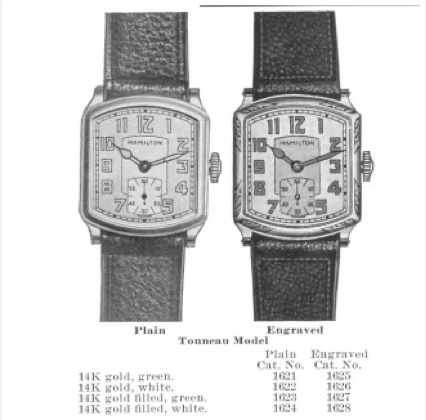 Watch designs vary by period too...1930's watches tend to be "larger" than 1940's and early 1950's. They got larger in the late 1950's and 60's but the styling is much different. The late 1950's also introduced enhancements like shock jewels, and automatics, etc. 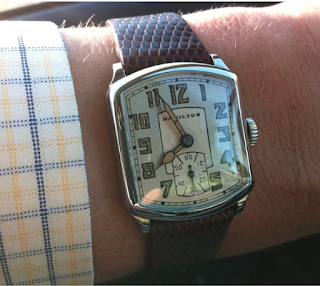 A "large" vintage watch will have a case width of 32mm or so. So you have to check measurements. Beyond that - beauty is in the eye of the beholder. I enjoy your site very much and use it for reference purposes in building my Hamilton collection. I am looking for a replacement crystal for a 1928 Tonneau. Could you give me a part number or lead me to a supplier. I am also looking for a crown to fit a 1932 Square B in green or yellow 14k. Hi Jim, In plastic, the Tonneau take a GS Y880 crystal and measures 26.2mm X 23.0mm. For the Square B you'd need a tap 8 crown in something that would go over the stem tube - that's a bit of a trial and error thing, I'm afraid. Thank you! That's a great help. Have you ever seen a 1929 Hammy Hastings in 14k rose gold? I have obtained this item from a collector in Argentina and it is in near pristine condition. All original and I think very rare! Nothing I can find says anything about a rose gold model but have found out that some were made for the South American market but not available elsewhere. That would be exceptionally unusual. Is it solid gold or gold filled? Rose gold wasn't really available until the late 1930's and again the 1950's (for certain markets). I'd love to see some photos. You can email me with the contact info in the upper right (above my photo) or through Etsy. Watch is 14k rose gold filled and appears original. Have questioned the seller who says it's an estate watch original owner's initials engraved on case back. I will get you some photos. Both Jack Kern and Rene Rondeau were quite impressed. Do you have a white dial with black numerals for sale for a 987 tonneau Hamilton.